Edit 7/25/2011: The image shown is of the August issue. Sorry, but I had to update my links, and the image of the old issue wasn't available anymore! If I found the June issue of The Writer only about a third useful, the July issue was a solid improvement. I'd say over half of the articles were interesting or useful to me. There seemed to be a digital theme for this issue. There was an article on ebook lending that I found very interesting, as it addressed whether the feature helps or hinders an author's sales; an article on virtual writers conferences; and another, less obviously-related article on how writers can go green. Apparently The Writer is also selling digital articles grouped in topics now, so that you can buy digital packets on your chosen subject: fiction writing, screenwriting, etc. There were also several articles on fiction writing, such as one defining the subgenres of fantasy (I found this useful as a reader, too, since I've wondered how exactly to define subgenres such as urban fantasy and steampunk), and another with tips for revision (that one definitely got bookmarked!). And from a freelancer's standpoint, I especially appreciated the articles on generating website traffic and pricing writing services. With all the articles that pertain to both my daily work and my other interests (fiction), I've decided to continue my subscription past the 14-day trial. It's been a long time since I've gotten a monthly subscription, but it seems like I'll really like getting it on my Nook (versus a physical magazine in the mail)! I don't purchase many ebooks, and most of the ones I purchase only cost a few dollars, but for Sookie I was willing to spring for the $12.99 price tag! I later found that I could have gotten Dead Reckoning from my library, but you know, I'm not sorry. I love the Sookie Stackhouse books enough to justify owning them (and I do own most of them, in ebook format). Anyway, I also get a lot of books out from the library, so between my purchased ebooks and the many freebies I've been downloading every month, my list of unread purchased ebooks is getting quite long. I managed to make time to read Dead Reckoning, but once I've read the library ebooks I have currently checked out, I'm going to focus on reading from my B&N library for a while. It's been nearly a year since I read all the Sookie Stackhouse books, and I'd been waiting for this one, the eleventh book in the series, for so long that I actually missed the release day by a couple of weeks. And then, of course, I had to finish the library books I had checked out at the time. And after all that, I blew through Dead Reckoning in less than a day... pretty much my track record for these books. Last year, I finished the entire series in a little over a week. Oh, it's so hard to decide what to write about Dead Reckoning, because I don't want to give away too much for those who haven't read the rest of the books yet, but are planning to. But I guess I've already given away in my other reviews that Sookie and Eric eventually get together, so that's no surprise. In this book, relations are getting worse between Eric and Victor, the vampire king's regent who has been appointed to rule Louisiana. Eric and his second-in-command, Pam, are plotting against him, and Sookie (naturally) gets drawn into it. At the same time, Sookie has someone after her, and it doesn't take her long to find out who: someone from a past book, bent on revenge. There are also a few revelations about Sookie's family and lineage, and nearly all of Sookie's past love interests show up in this book. There is a lot going on in Dead Reckoning, but I couldn't help but feel it was leading up to the next book, setting the stage for some significant changes in Sookie's love life, and maybe her entire life as a whole. It will be interesting to see where the next book goes, though of course it probably won't be out for another year! Since I got my Nook last month, I've been interested in trying out a periodical. Unfortunately, I have no interest in most of the magazines that are available on Nook, and I see no point in paying for a newspaper subscription when it's so much easier (not to mention free) to get the same articles online. So I was really excited when B&N announced that The Writer is now available on Nook. The subscription costs $3.50 a month and you can cancel at any time (which makes me wonder why anyone would pay $6.95 for the individual issue). Best of all, there is a 14-day free trial. The way my trial is timed, I will get two issues: the most recent one, and the next one, which comes out on Nook on May 28th. I had mixed feelings about this issue, but on the whole I think there was some useful stuff in it, at least enough to justify a small business expense every month. About two-thirds of the articles I thought were mostly fluff pieces, chatty but with no real interest to me. The other third of the articles, on the other hand, were genuinely interesting and useful, and I found myself bookmarking several for later. For instance, there was an article on making the most of your time, with several suggestions that I could definitely stand to apply to my life — I've been feeling for months now, maybe even a year, like I've got increasingly less control over my time, but that's probably a topic for my freelancing blog. Another article gave some tips on handling simultaneous submissions — nothing ground-breaking, just good, common-sense advice. I'm looking forward to my next issue, which comes out tomorrow! I recently finished the Millennium Trilogy by Stieg Larsson, and thought I should also mention the boxed set that is available. It's a really nice set, and I remember eyeing it around Christmastime. The boxed set also includes a slim volume called On Stieg Larsson, which is apparently a collection of essays about the author, including some correspondence with him. The Barnes & Noble product page has a video about the boxed set, but apparently there is no way to embed it on my blog. I do recommend clicking on the image link and scrolling down to watch the video if you think you might be interested in owning nice collector's editions of these novels. It was a long wait to get this ebook from my library, but finally it was my turn. It was pretty long, but by the time I was almost halfway through with it, I could hardly put it down. I read almost the entire second half of the book Monday night, and was up until after 2am to finish it. In my opinion, this is the best book of the three, but I know I've talked to some people who found it the darkest and therefore the hardest to read. I loved it though. Lisbeth's character is fairly slow to develop in the first two books — you don't really find out much about her in the first book, and the second book only starts to develop her character more. In the third book, however, Lisbeth is in deep trouble. Having been wounded at the end of the second book, Lisbeth spends most of the time in the third book in the hospital, with the possibility of a prison sentence looming over her. Blomqvist convinces her to fight it out in court, and while she is able to help a little thanks to her computer hacking abilities, most of the investigative work falls to several different factions who are trying to find out the truth about the super-secret division of the Swedish secret police that had Lisbeth committed when she was 12. At the same time, "the Section" is viciously fighting back, trying to protect themselves by making sure their decades-old secrets stay buried — at any cost. There is a lot going on at once in this novel, and as a result the plot is complicated but extremely suspenseful. One of the things I like about Stieg Larsson's books is that he doesn't use eleventh-hour crises to maintain suspense — instead he maintains it through a complex plot that all comes together neatly at the end. It was quite a satisfying ending! This is one of those nonfiction books that I've read on the side here and there. It was one of the titles my library added to their ebook collection recently, so I snapped it up. I read it pretty enthusiastically until a few chapters in, when the author said that a one-person business is not a business at all. She basically said that it's not worth your time at all to build a business if you are the only person in the business, because it has no value and cannot be resold. Essentially, she is saying that all of the time and effort you put into marketing and other business-running tasks are wasted, because you aren't building something as value. I'll address this issue a little more on my writing blog next week, but for now, suffice it to say that since I'm a freelance writer, I didn't appreciate this bit of "wisdom." As a result, I put the book down for several days before finally picking it back up again and skimming through the rest. The rest of the information in the book I wholeheartedly agree with. She talks about some of the biggest fallacies that lead people to start their own businesses — they want to make their living doing what they enjoy, they want more time off or a more flexible schedule, they want to be their own boss, etc. — and explains why each of these is a terrible reason for starting your own business. For instance, fost people underestimate the amount of time they'll be working as a business owner, not to mention the amount of time they'll be spending doing other things — marketing, financial stuff, administrative, etc. So little of your time ends up being spent on "what you love," that if that's your incentive, you are better off just getting a job doing what you love. All this kind of stuff I agree with. But I totally disagree with building a one-person business being a waste of time, and I'll explain why on my writing blog. It was hard to get past my resentment over that statement so that I could enjoy (and learn from) the rest of the book, but I still found it to be pretty useful. Even if it supposedly didn't apply to me. Just a word of warning: This is not a book to help you start your own business. It's a book to help you decide whether you are really the right person to start your own business. She's right that many startups fail because the owners have no business (please excuse the pun) running a business. This book is designed to help you decide whether or not that's you. Recently I read a book, Swoon, via Barnes & Noble's Read In-Store feature on the Nook. Basically this allows you to read entire books for free while you're in the store. You only get an hour per book per day, but you can read the entire thing for free that way, and not just a sample. In general, I found Read In-Store to be a great feature, one I plan to use regularly from now on. There are a few drawbacks, of course — you can't change the font style or size, or use bookmarks, notes, or the table of contents. Also, it counts each Nook screen as a page, which gives you almost double the actual pages. However, it will remember what books you read in-store recently, and take you back to where you left off last time. I do recommend that if you plan to buy the book, you stop reading at the end of a chapter, to make it easier to find your place in the book. The Nook will not remember where you were if you switch from Read In-Store to a purchased copy, and since the pagination is all screwed up, you'll have a hard time finding where you left off. Another drawback is that the Nook downloads each page from the server every time you advance one page in the book. This means two things: 1) You are dependent on the Internet connection, and 2) The wireless on your Nook has to stay on constantly, which drains the battery much faster than usual. I did encounter some problems with the next page not loading, but found that if I accessed the book from Shop > Recently Read In-Store > [book title] instead of getting there via Reading Now, the problem generally went away. Despite the drawbacks, I loved using the Read In-Store feature, and plan on always reading something in the store. It took me a couple of weeks to get through Swoon, and of course since I could only read in the store I often had to wait to see what happened next; but for books that you think you might not want to spend the money on, this is a great option. 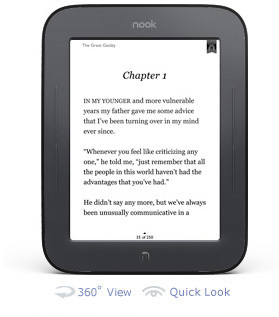 You might have noticed that the new banner ad across the top of my blog states that the Nook Color now has apps. It's true! Barnes & Noble just did an update to the operating software that allows you to download apps onto your Nook Color. The main justification for this seems to be Angry Birds, which if you haven't heard of it yet, is a highly addictive game on the iPhone, iPad, and other touch-screen smart phones. I'm not sure if the new update allows you to download the Kindle app, but of course I rather doubt it. However I've long thought that would be a great way for Barnes & Noble to capture previous Kindle customers. Because buying DRM'd Kindle books locks Amazon customers into the Kindle, since the ebooks can't be read on any other device without stripping the DRM, allowing the Kindle app to be downloaded to the Nook Color would enable Kindle customers to switch over to another eReader without losing their existing library. Of course, there is a workaround. Rooting the Nook Color turns it into an Android tablet and allows you to download the Kindle app, although of course that means you need to read your ebooks with the Nook app (instead of the built-in Nook software that you had pre-rooting). Not a bad deal for previous Kindle customers who want to switch over to B&N, or who want to expand the number of ebooks available to them. Although the agency pricing model has eliminated many of the pricing discrepancies, Amazon still does have more free ebooks and often has ebooks available at better prices than B&N, so rooting the Nook Color would give you, quite literally, the best of both worlds. I just downloaded a bunch of freebies this morning. A few are from Sourcebooks, a publisher that only tends to make their freebies available for a couple of days, so don't wait to check out the new offerings!